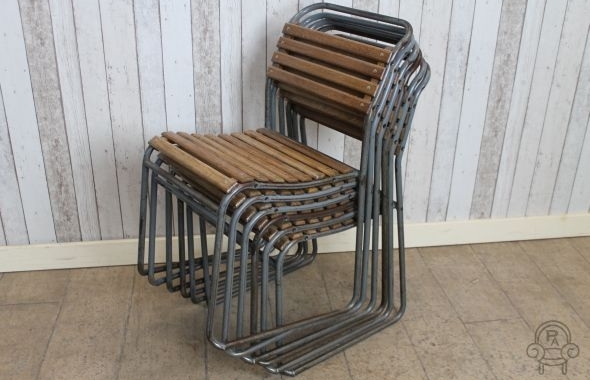 Please note that this listing is for one slatted chair only, but we do have a large quantity in stock. 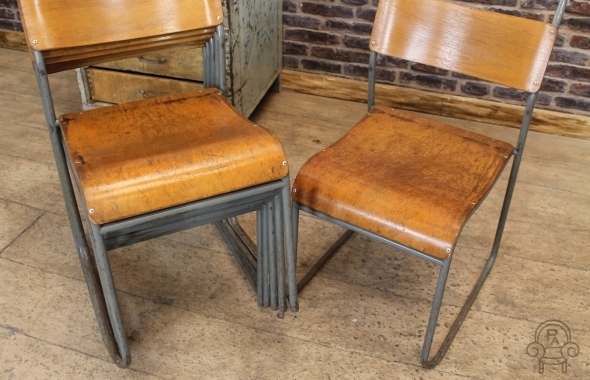 These industrial vintage chairs are a fantastic item of classic furniture. 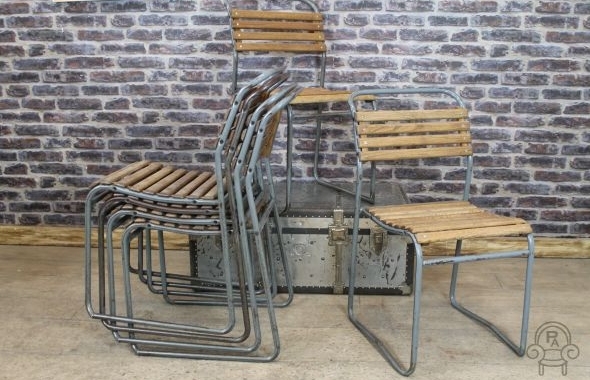 The slatted school chairs are very sturdy and conveniently stack, making them a useful addition to any dining room or kitchen. 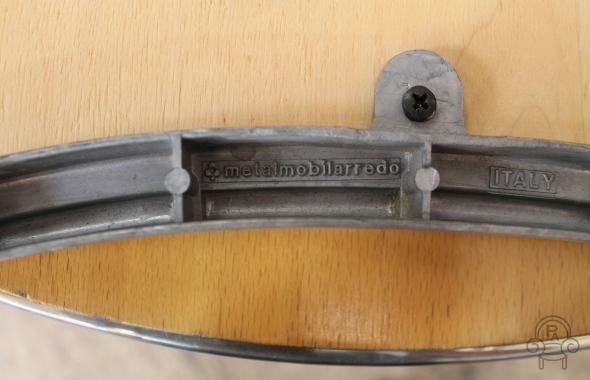 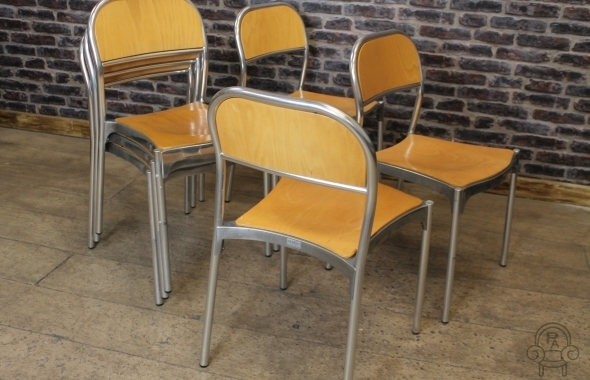 The steel work of the chairs has no breaks and the items are in a good condition. 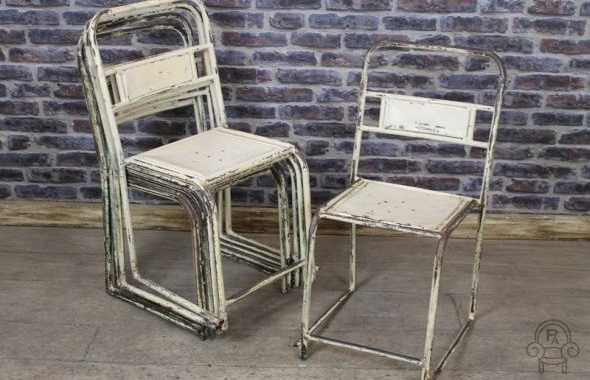 They have been in daily use, and so may show signs of wear and tear and marked paintwork, only adding to their original look and appeal. 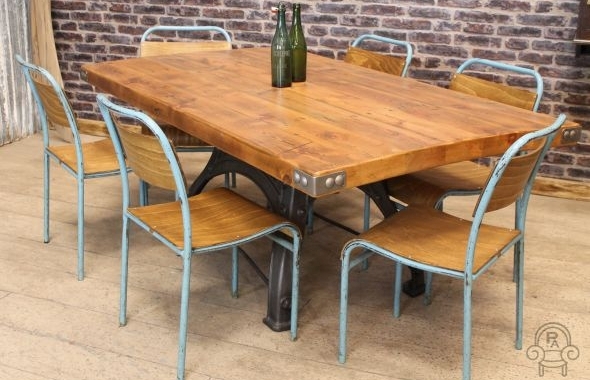 Other items photographed are not included in this listing. 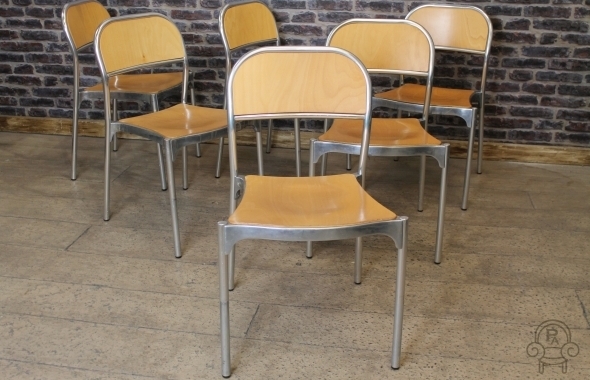 Please note this listing is for one chair only, but we do have more in stock. 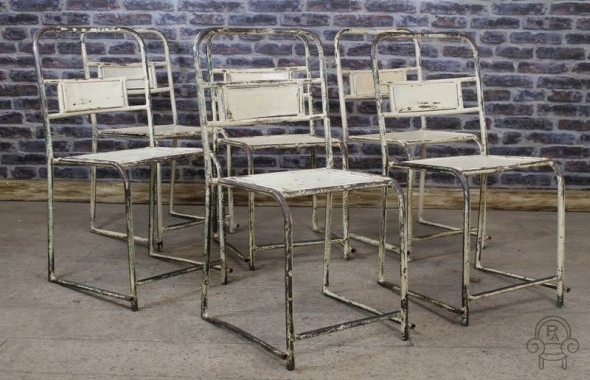 These authentic white vintage industrial chairs are a fantastic addition to our collection of industrial and vintage style furniture. 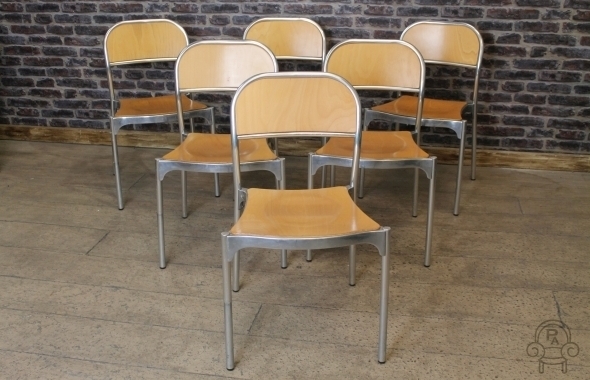 We have a large quantity of these chairs available in a selection of styles and colours. 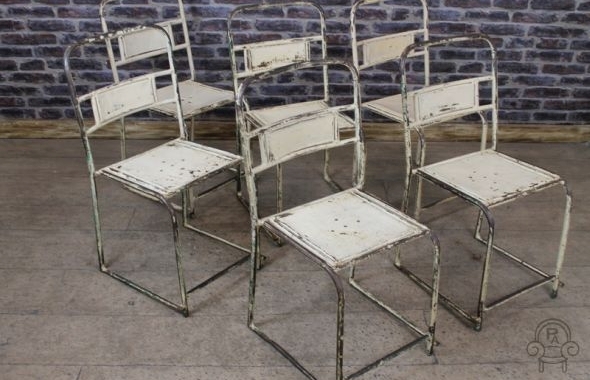 All of these white restaurant / cafe stacking chairs do have visible signs of wear and tear, damage to the paintwork and spots of rust; this adds to their very unique style and appearance. 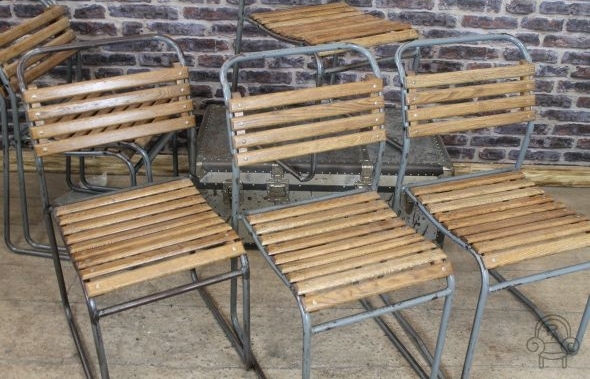 These original vintage industrial chairs are full of character and they would make a lovely addition to any cafe, bar, restaurant or private garden. 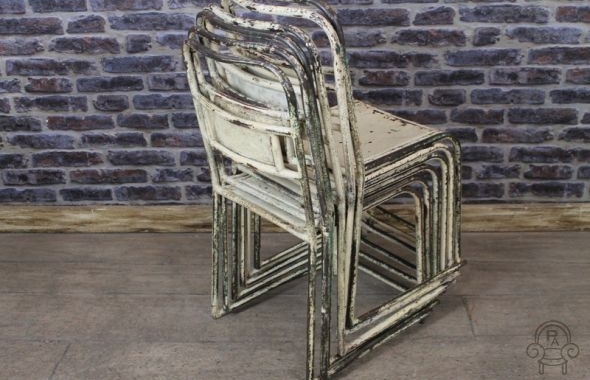 Please note this listing is for one chair only. 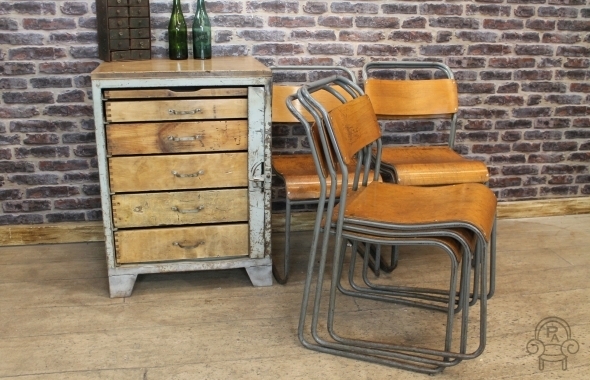 These fantastic vintage stacking chairs are timeless items of classic vintage industrial furniture. 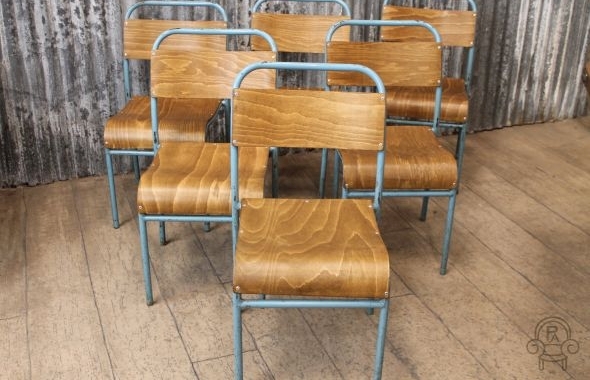 These sturdy plywood original vintage stacking chairs have distressed blue steel frames and feature curved wooden seats and back supports. 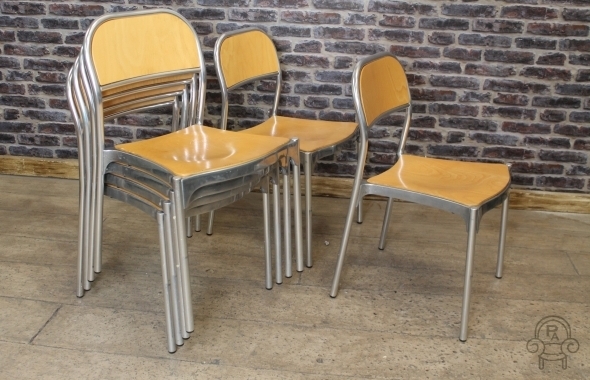 The chairs are very durable, and their stacking ability makes them a useful addition to any contemporary dining room or kitchen. 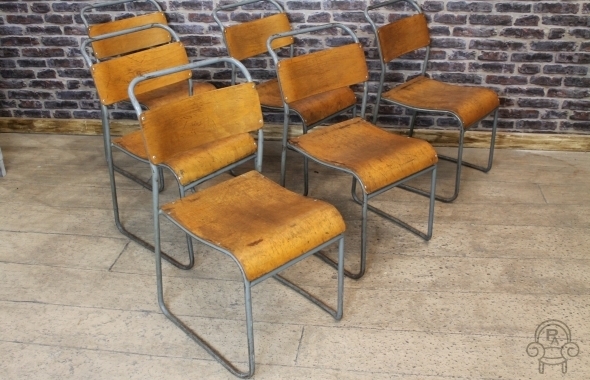 All of these chairs are in a good condition, with no breaks to the steel framework. 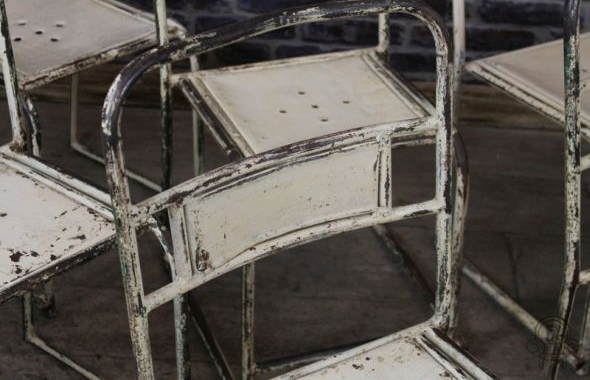 As you can appreciate, there may be signs of general wear and tear due to the items being in used on a daily basis, we feel this only adds to their urban appeal and character. 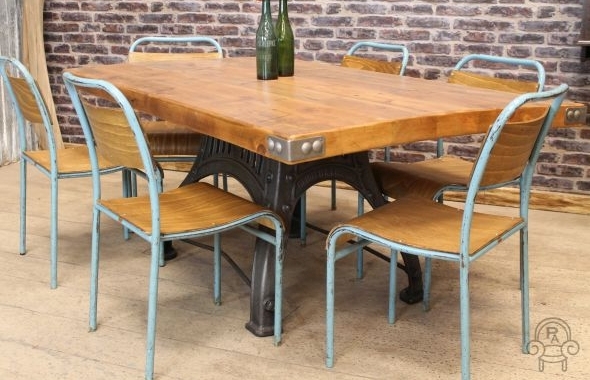 Please note the other items pictured are not included in the listing but can be purchased separately. 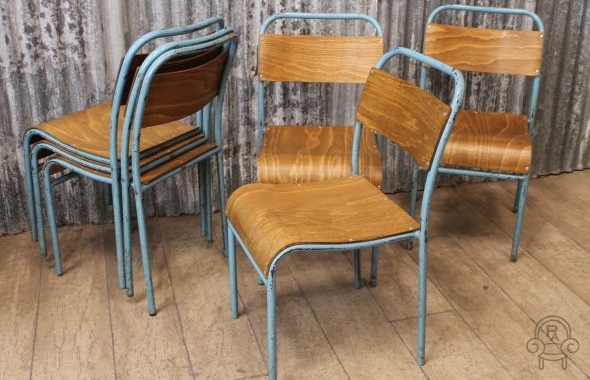 This listing is for one blue framed vintage stacking chair, but we do have more in stock. 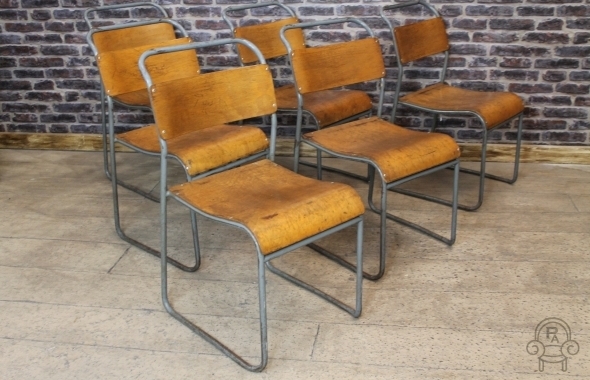 These vintage British stacking chairs are an excellent addition to our collection of metal stacking chairs. 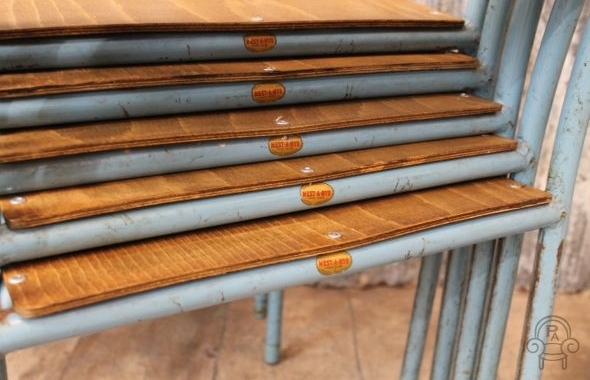 The original plywood seat has a nice patina, and the chairs feature a battleship grey frame. 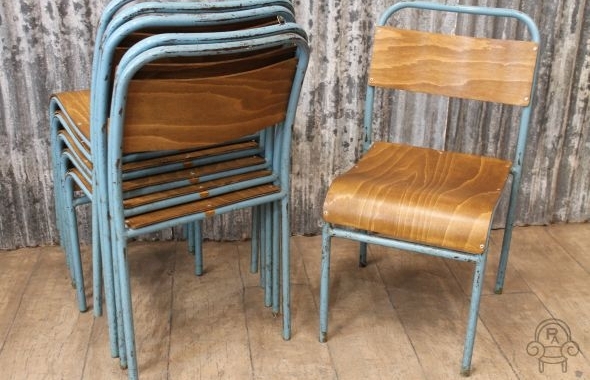 The chairs have a nice patina to the original plywood seat and feature a battleship grey frame. 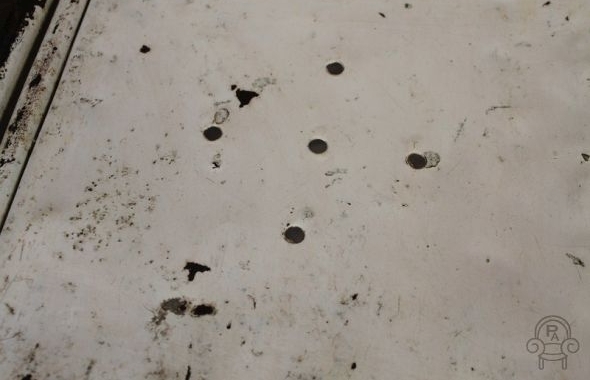 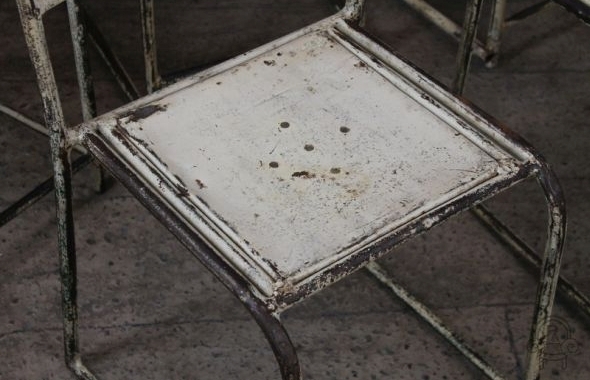 The chairs do have general marks and wear and tear, which we feel only adds to their character. 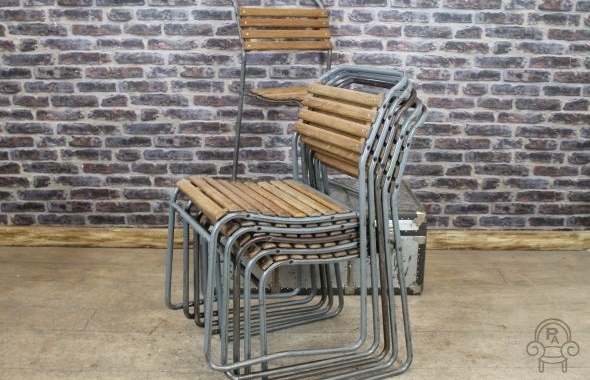 As they conveniently stack, these chairs would be ideal for those who have limited space. 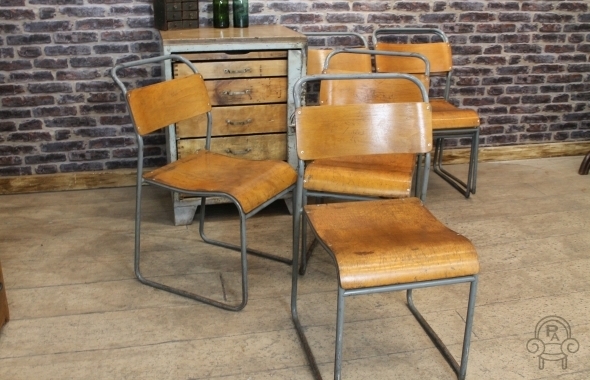 These chairs would be ideal for any vintage or contemporary style interior. 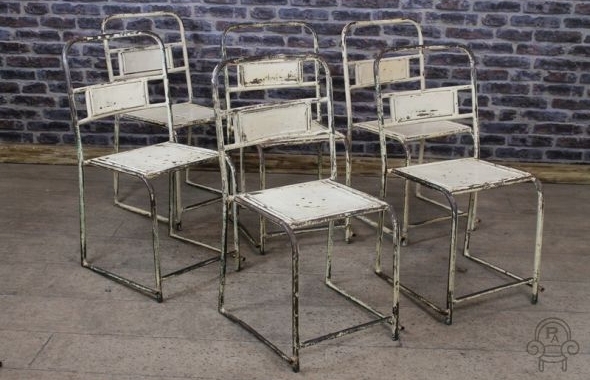 Please note this listing is for one chair, but we do have more available and they can be purchased individually or in lots. 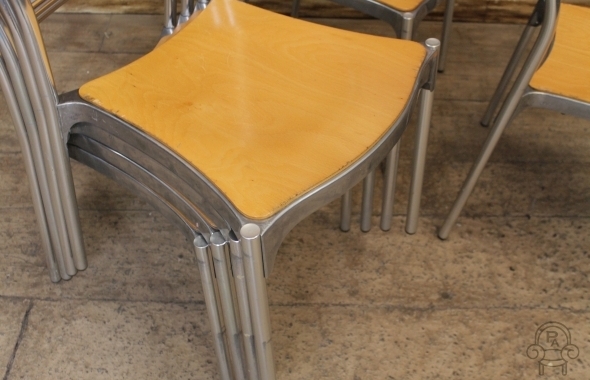 This is a fantastic opportunity to buy some great quality plywood and cast aluminium retro stacking chairs. 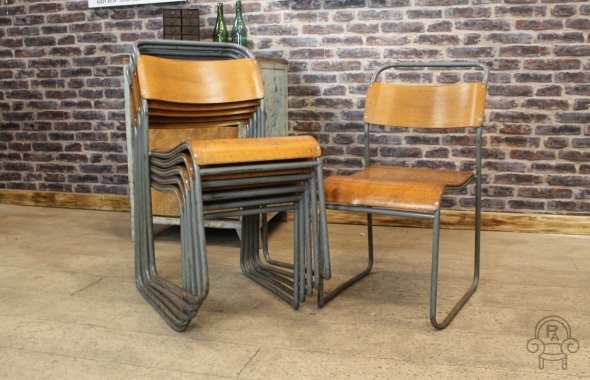 These retro 1980s cafe or restaurant stacking chairs have recently come from an upmarket hotel in the centre of London. 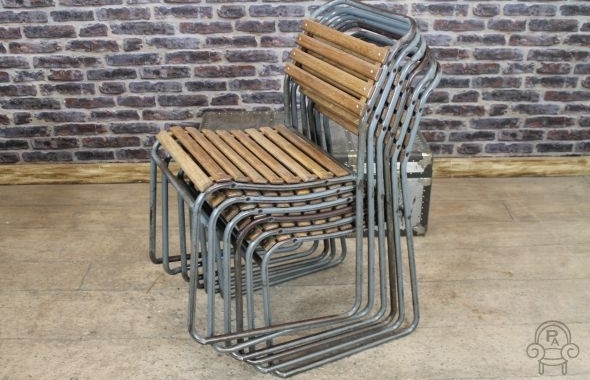 The chairs have a unique Italian style and can conveniently stack to save space. 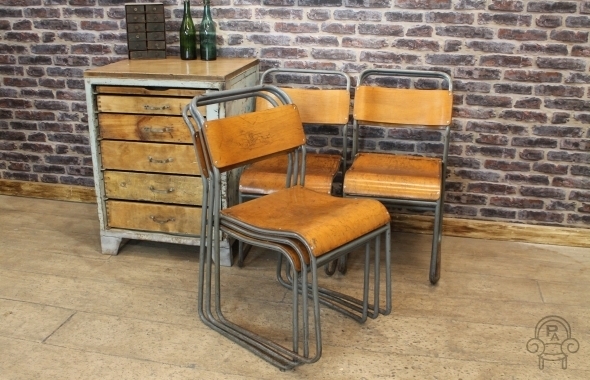 The retro stacking chairs are all in great condition for their age, with just a small amount of cosmetic wear and tear. 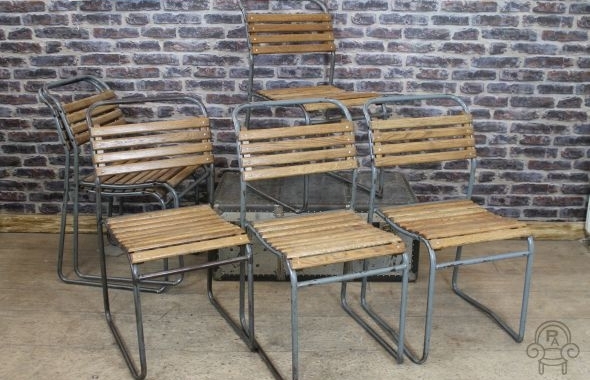 Please note that this listing is for one restaurant stacking chair, however, we do have a large number of in stock and they can be purchased individually or in sets.